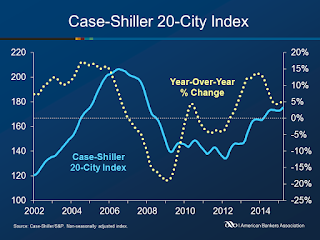 The 20-City Case-Shiller Compositev Index﻿ gained 5 percent year-over-year in March, consistent with February’s gain. The 10-City Composite gained 4.7 percent in March from the previous year, down from the 4.8 percent year-over-year gain in February. The National Index recorded a 4.1 percent gain on an annual basis in March, compared to a 4.2% annual gain in February. The 20-City Case-Shiller Compositev Index gained 5 percent year-over-year in March, consistent with February’s gain. The 10-City Composite gained 4.7 percent in March from the previous year, down from the 4.8 percent year-over-year gain in February. The National Index recorded a 4.1 percent gain on an annual basis in March, compared to a 4.2% annual gain in February. On a monthly basis, all three indices posted increases as the 10-City Composite increased 0.8 percent, the 20-City Composites rose 0.9 percent and the National Index rose 0.8 percent. The increase this month brought the 10-city and 20-city indices back to their autumn 2004 level, but still remain roughly 15-16 percent below their June/July 2006 peak. Only New York reported a monthly decline in March, falling 0.1%. San Francisco reported the highest monthly increase, rising 3 percent, followed by a 2.3 percent increase in Seattle. Year-over-year, San Francisco increased 10.3 percent, the highest of the 20 cities, followed by 10 percent growth in Denver and 9.3 percent growth in Las Vegas. Cleveland and Washington reported the slowest year-over-year growth, increasing 1 percent, followed by a 2.7 percent increase in New York.